We describe the development and maintenance of an expert system to advise on the configuration of systems for ion-exclusion chromatography. The aim of the system is to define appropriate conditions for the separation of desired groups of acids or bases. The system is implemented in a rule-based system, multiple classification ripple-down rules, which offers multiple conclusions from rules based on the attributes of the system. In this case the attributes include physical and chemical properties of the solutes and the availability of instrumentation and accessories. With this information the method conditions can be defined for the detector, mobile-phase, whether suppression is to be used, and other ion-exclusion chromatography method conditions. A unique feature is that some conditions may be filled in by the program or be given by the user. Because of the nature of the "ripple-down rules" approach, in which new knowledge is always added as an amendment to an existing conclusion (and therefore cannot interfere with other conclusions), the expert or user can maintain and alter the system easily according to their own needs without the help of a software engineer. 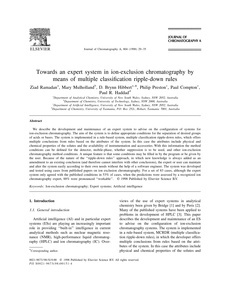 The system was developed and tested using cases from published papers on ion exclusion chromatography. For a set of 83 cases, although the expert system only agreed with the published conditions in 53% of cases, when the predictions were assessed by a recognized ion chromatography expert, 88% were pronounced "workable".